Fitch-Rona EMS paramedics are among the most highly trained and dedicated paramedics found within south-central Wisconsin. We provide an aggressive approach to EMS involving some of the latest technology for delivering emergency pre-hospital care. Fitch-Rona paramedics are trained to provide the highest level of pre-hospital care that is allowed by state and local guidelines. Our medical director, Dr. Michael Mancera, is committed to keeping our paramedics on the cutting edge of EMS. With the support of the communities we work in, we are provided with the highest quality equipment enabling us to offer pre-hospital care as it is meant to be delivered. Our primary coverage area consists of the Cities of Fitchburg and Verona as well as the town of Verona. We also provide paramedic intercepts to other EMS services in south and southwestern Dane County. We are committed to our goal of making available the highest level of pre-hospital care that can be offered to the communities we serve. 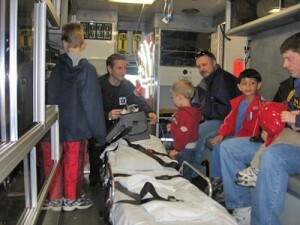 Fitch-Rona Emergency Medical Services District continues to evolve and increase the level of support for our district. It is enlightening to look back and see how far the service has come. From a total volunteer organization with a single response vehicle to full-time paramedic level service with three ambulances operating from two stations is an impressive transformation. There are also many important aspects of the service that go on behind the scenes in a support role. Even in early 1977 as ideas of establishing an emergency medical service were beginning, thought was given to the level of care necessary and to funding concerns. What came about from those discussions was very advanced for the time and is proving to be advanced even today. Fitch-Rona was developed as a municipal district that shares the costs of the service between three communities. This approach allowed the funding issues to be spread among a greater population but as importantly the wider geographic district brought in additional requests for service providing staff with a means to continually improve skills. We are proud of our involvement with this department as it moves past 30 years of servicing the cities of Fitchburg and Verona and the Town of Verona. Our community improvement projects have been an important development in recent years starting with our placement of Automatic External Defibrillators into community businesses and public places. The staff has added the development of a medical bike patrol to our goals for the next few years hoping to improve our ability to work with community events. When we allow ourselves a look back over the history of Fitch-Rona EMS we can be proud of those that took great care to shape a service that is focused on the needs of today and tomorrow.